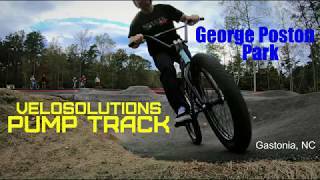 George Poston Park's newest addition is built by the world famous pump track builders, Velosolutions. It has an asphalt surface and is incredibly well-built with many line choices. It is fun on just about anything you can ride—bikes, scooters, skateboards, or even rollerskates. It is a welcome addition to an already great trail system.